Summer linen shirts are in the limelight because of its comfort, style and unique fashion statement. Bring grace to your looks with linen fabric. Summers are usually very hot.Especially if you talk about a country like India the temperatures are high.Temperature ranges 45°C in states like U.P., New Delhi, Rajasthan, Bihar, Jharkhand etc. The perfect outfit in such season is summer linen shirt. The most notable factor about it ,is the fabric and raw material used to make it. Typically, these shirts are made out of cotton which makes it light in weight and easy to wear. Also, it is specially designed to keep your excess body heat,instead of trapping it between the gap of your body and the shirt. The customers are advised to buy summer linen shirts. These shirts are light coloured. Usually dark coloured shirts tend to absorb the extreme heat by the sunlight, whereas light coloured shirts tend to reflect thereby making the person feel quite comfortable. There is an array of brands that makes such shirts.The most famous brands are Arrow, Blackberry Mufti, Numero UNO, U.S. Polo Assn. These shirts are produced not only for men but also for women too.Especially those who work in big corporate prefers it.Every brand has its own style of engineering its garments.Most recently the Arrow brand has come up with its own patented style of shirt known as The Stitch less Shirt. These types of summer linen shirts are made with a special technique.In this an optimum amount of tensile strength is used.It makes the garment strong durable and free from normal wear and tear. If one talks about style then it have the most variety of designs. The style starts from formal shirts,worn during formal occasions which suits with formal trousers. Another style of shirt is the casual shirt which has a little bit different structure and look, that distinguishes it from other brands. Their sleeves are somewhat diverse.Shirts look best with their sleeves folded and a thin cloth coming from underneath.Then buttoned on top of its sleeve. One must remember that before buying summer linen shirts it is mandatory to check the fabric first.It is just to ensure whether the shirt will be comfortable to you or not.It should of good quality and durability too. Often shopkeepers try to sell the kind of piece which is filthy (dirty) and look for discount offers if available. 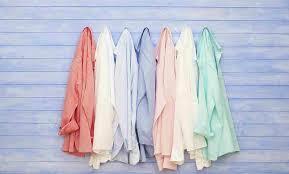 Keeping in mind the current market trend and demand, the need for summer linen shirts has become important. Another striking feature is being a summer shirt.It can also be worn during winters. It can be worn under your sweater, jacket and you can spread out your shirt collar out of your sweater. In case of Jacket ,you can flaunt your shirt’s lovely color. Then what are you waiting for? Grab a summer linen shirt from your nearest store or internet and keep beating the heat.